I used to think that primers were an unnecessary step and that they didn't make a difference on my skin. Until I tried the primers from 100% Pure! I have tried a handful of face primers and most just made my skin extremely oily or didn't do nada to my skin. Lets take a closer look at both of these primers. The first one I tried was the Luminous Primer, got it on sale for only $10. As you might already guessed by the name it gives a luminous glow. The luminosity is not overwhelmingly shimmery or shiny, which is a huge plus for me and my oily t-zone. I love that it feels like a serum, its has a milky iridescent look to it and it does not have that silicone feel that most primers do. Its moisturizing and it gives me a nice smooth canvas for my makeup. It didn't make my makeup last longer but its a nice first step to prep my skin. If you want a glowy, healthy finish, then this one is the one for you. 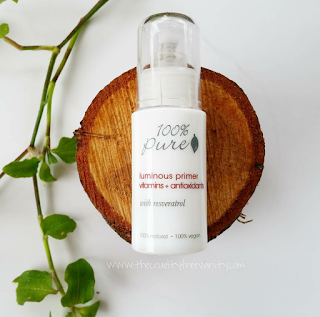 I just recently finished a whole bottle and will be repurchasing it when 100% Pure has another good sale. The one I'm using now is the newest formula that 100% Pure created, the Mattifying Primer. Loving this soooooooo much! Its my favorite of the two. This one definitely feels and looks like a regular primer clear with the silky, velvety, silicone feel. But the crazy thing is that it doesn't contain silicone nor dimethicone! Which blows my mind because it feels like it does. Obvi, it's a matte formula, due to it not having any luminosity. However it didn't keep my skin matte through out the whole day. It can be because my t-zone is just too oily. My favorite thing is that it smooths out my skin and fills in my pores, which gives my skin an amazingly smooth canvas for my foundation. I can see the difference, and I love it! I don't notice it making my makeup last longer either but I absolutely love the finish it gives my skin. Both are amazing primers, they are both vegan, natural, and of course cruelty free. They both are a wonderful way to prep your skin for a flawless makeup application. I recommend both, of course depending on your skin type. The Luminous ($35) is a tad bit cheaper in price than the Mattifying ($45) one, but both are on the pricier side. 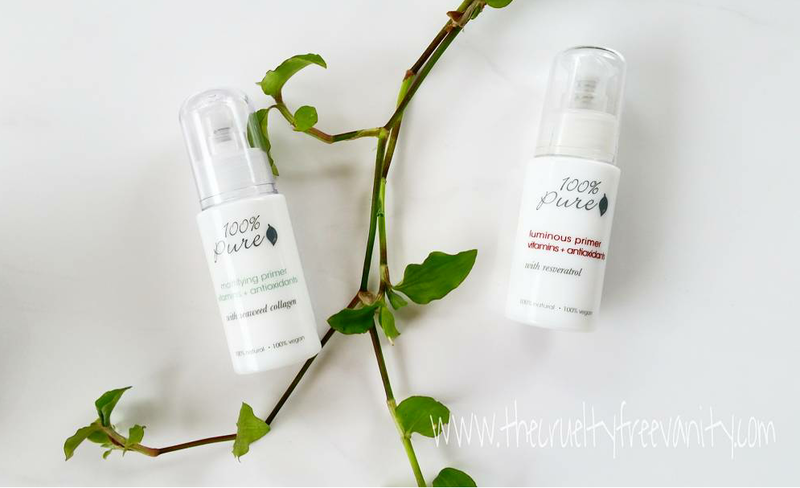 100% Pure now offers free shipping & returns on all U.S orders, nice right! Thanks so much for stopping by, hope you all have an amazing day. ***Giveaway is now Closed! Winner was Mane Topic, congrats! 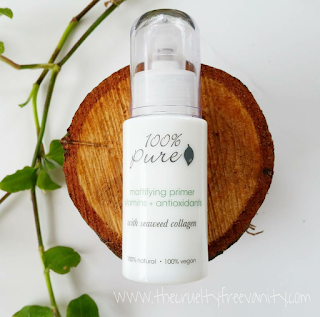 Want to win a bottle of the 100% Pure Mattifying Primer? Yes! Of course you do! Answer any of the questions below and leave it in the comments. I will choose a winner in a few days and announce it on this post! Good luck dolls! Have you tried any of these primers? If so what are your thoughts? What are your thoughts on primers in general?